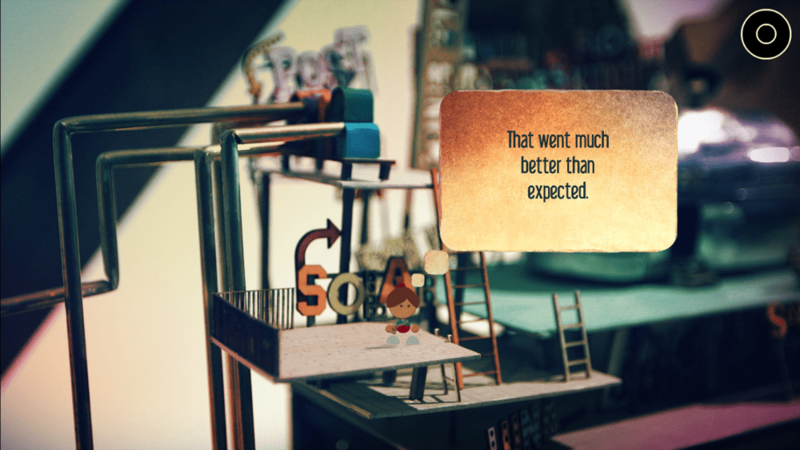 State of Play’s Lumino City checks off so many boxes that would make for the perfect iOS point-and-click adventure game. Obviously, the part that stands out the most is its artwork. 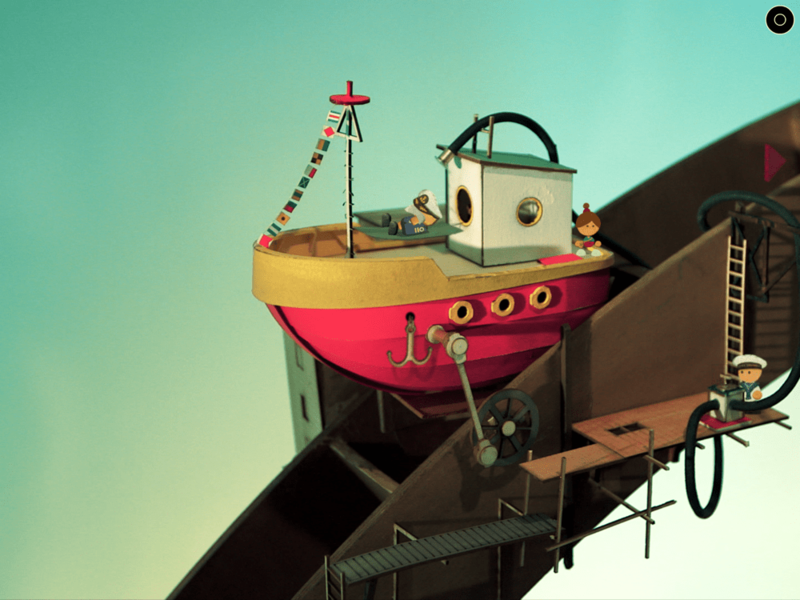 The scenery and puzzles were built by hand and then recorded using stop motion animation. So just about everything you see in the game is real, not CGI. 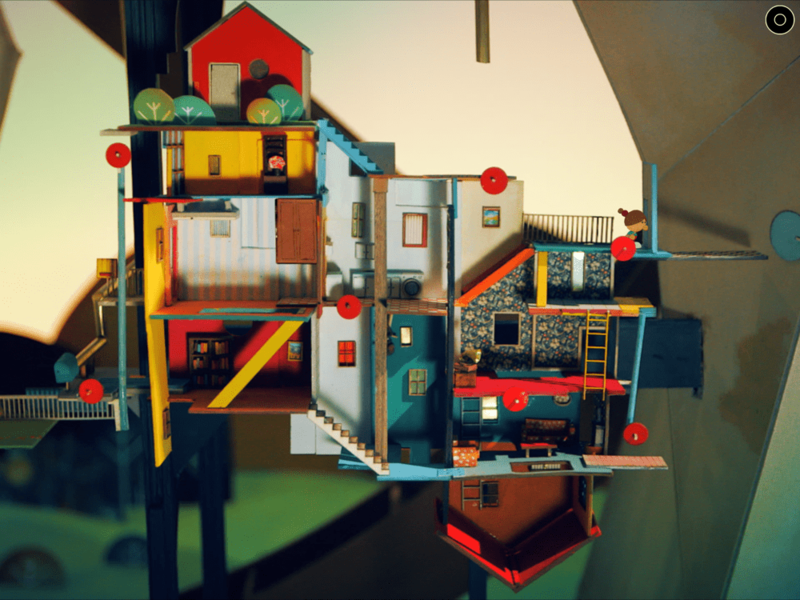 That’s a lot of effort to put into a game, and it makes Lumino City quite special. It’s also why I was looking forward to playing it on iOS. And the game started off great. 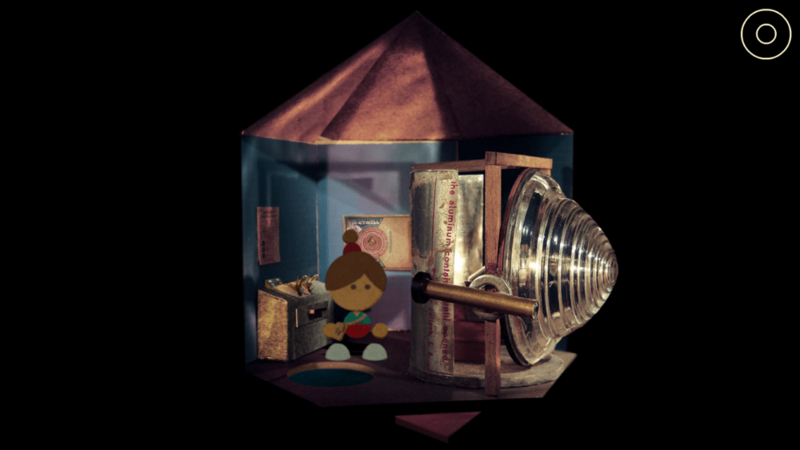 It follows a girl named Lumi on a search for her grandpa after he’s abducted from his home during afternoon tea. It seems like the perfect fit for iOS, even though it was originally designed for PCs. I like that the game is broken up into bite-sized chunks, each of which you can revisit any time after you complete it. I’m glad that the dialogue is short and sweet, without long cutscenes to watch. It’s the perfect game to pick up and play in short bursts or to sit on your couch with for hours. The iCloud saves are flawless, allowing you to sync your devices and swap between them as often as you want. Not only does it sync your progress for levels completed, but also within the level you’re currently playing. I honestly can say it’s the most reliable use of the iCloud I’ve ever seen. I’ve not had a single issue with it, even if I leave the game open on one device before switching to the other. It still picks up where I left off on the first device. I don’t think I even knew cloud saves could work this well, and it’s certainly raised my expectations for the future (sorry, game developers!). But the game shoots itself in the foot sometimes with its artwork. There are eighteen sections in the game and I got stuck on the sixth because I didn’t notice a very crucial piece that blended into the background. I ran around and around and around trying to figure out what I missed, but eventually someone had to tell me about that object so I could pass. Unfortunately, this was only the start of my frustration. The next level brought even more rage, this time due to lack of feedback from the game. I had to do something specific to get things rolling, but I had to be standing in a certain area for the game to recognize it. Otherwise, nothing happened. No feedback to tell me I’m doing something wrong. Just nothing. Usually if you tap on something in a point-and-click adventure and the character can move there, the game will send them there, no matter where you are when you tap. That’s even the case often in this game, which is what makes it even more frustrating when it doesn’t let you do that. I was ready to assume it was a glitch, but then I tried something I wasn’t sure I had yet and it worked. This could have all easily been solved by the game saying “I can’t reach that from here” or something similar. But dead silence is the worst. To the developer’s credit, there is a little “bloop” sound when you tap on something interactive. So I will give them that. But it’s just not enough feedback. It feels like so much time and effort was poured into the visuals of the game that they forgot about making it a proper puzzle adventure. As I continued playing, I realized that this game could make a really great case study in puzzle design. There are so many things it does right, but many things it does wrong that keep it from being the perfect adventure game. I’m going to try to touch upon these things vaguely first so as not to spoil the game too much for those who haven’t played. Then, I’ll break down each chapter into what worked and didn’t work, for those who are interested in seeing a more in-depth analysis of the puzzles. Those who have been following me for a while might know that I despise hidden object games. I can stomach a hidden object scene here and there, but for the most part, they just feel like filler and a waste of time. This extends to adventure games that don’t have hidden object scenes but hide some items a little too well, resulting in pixel hunting. As I mentioned earlier, that was the whole start of my frustrations with this game. But additionally, there were a few points where I missed arrows that show there’s a path available. They blended too well into the scenery when they should have been more obvious so you know the scene extends further. 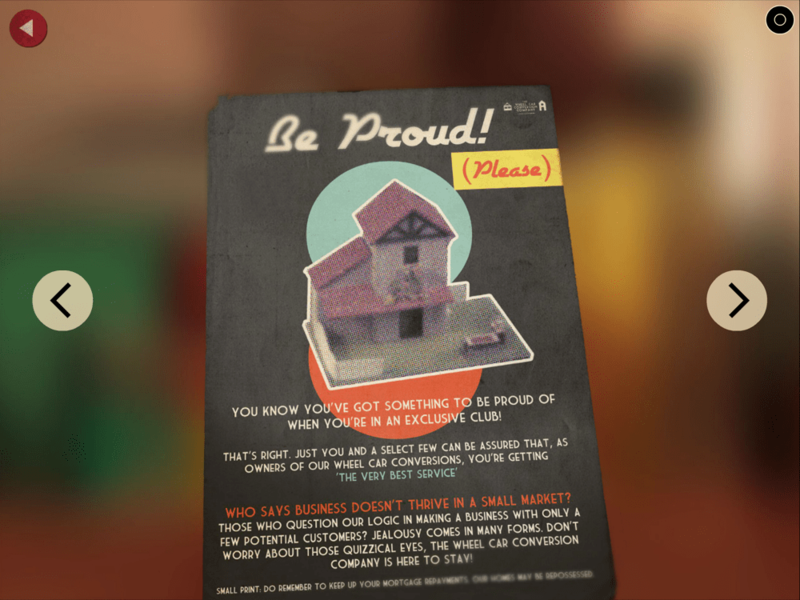 A game shouldn’t hide these things from you. 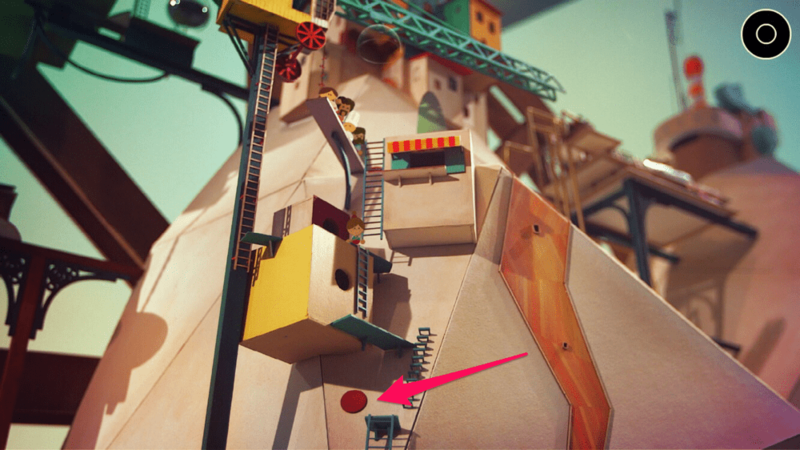 Good puzzle design makes the player think “what should I do?” not “what can I do?” When so much of the artwork is abstract, you can’t assume players will recognize that a dot is an important part of a puzzle or notice an arrow that blends in well with the scenery. A hotspot highlighter and more feedback from the game could have gone a long way. It’s just not good puzzle design to hide a whole playable area from people. That’s not to say the puzzles were necessarily too hard or needed to be made easier. I just felt like I was playing blind half of the time. It’s almost like they used obtuse puzzles to extend the playtime. The more time you spend wandering around looking for some little thing you missed, the longer the game seems. Another issue is that the game doesn’t always fit well on an iPhone. I was excited about the iCloud saves working so well, so I could take the game with me on my iPhone and continue at home on my iPad. But unfortunately, the small screen of my iPhone 6S makes it hard to see many necessary details. The Handymanual, which is used for hints, is especially hard to read on my iPhone and there’s no way to zoom in. So I often found myself having to wait till I got back to my iPad at home to complete certain puzzles. 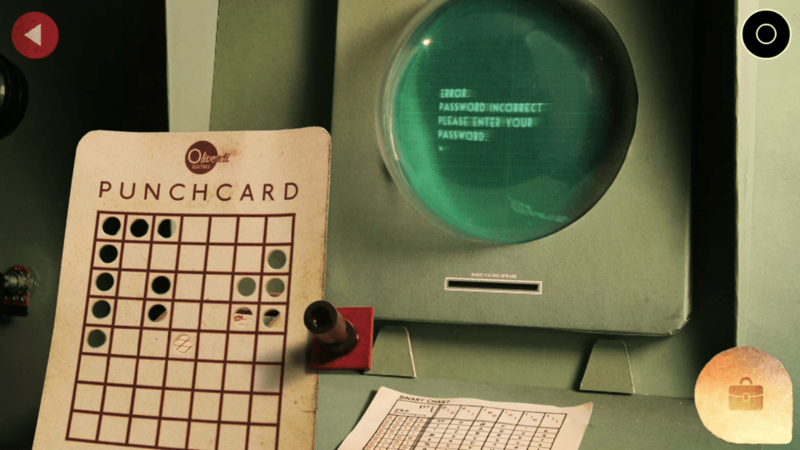 One especially irksome puzzle asks you to punch holes in a punch card. I had no issues on my iPad, but when I tried to do it on my iPhone, I kept hitting the wrong spots. I think it could have been zoomed in a bit more to make those mistakes less likely. 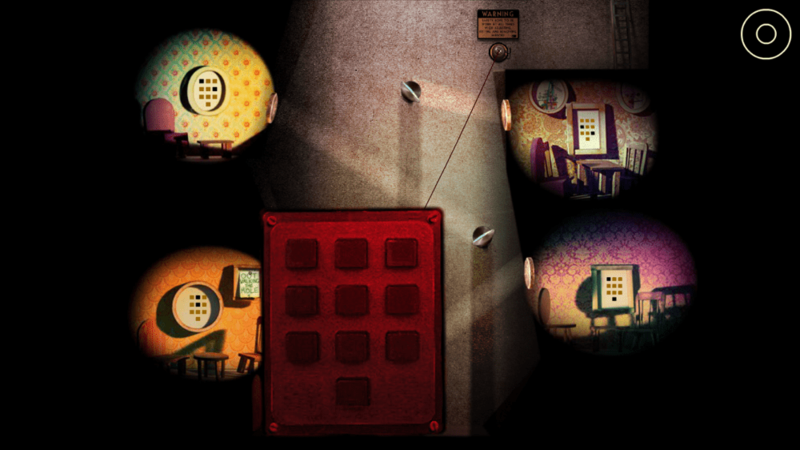 To the developer’s credit, they did adjust some puzzles so they’re easier to see on an iPhone. For instance, there’s a light reflecting puzzle that’s split up into two screens instead of the single screen of the iPad. 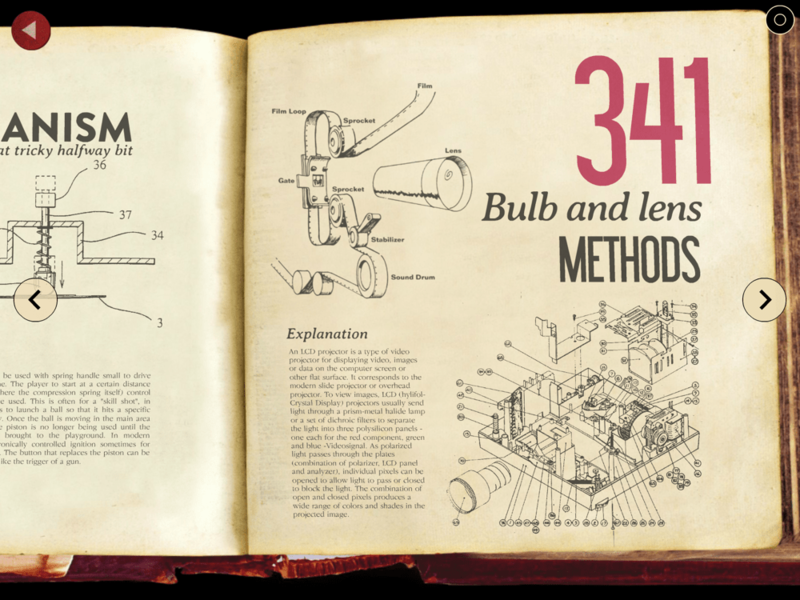 But a zoom feature, at least for the handbook and certain other areas, would have made such a big difference. If you have two devices, it’s still great to be able to take the game with you on your iPhone and pick up where you left off on your iPad. But those who only have an iPhone may run into trouble. Another thing that led to frustration is how the inventory is accessed. For most of the game, you tap on Lumi to open it. 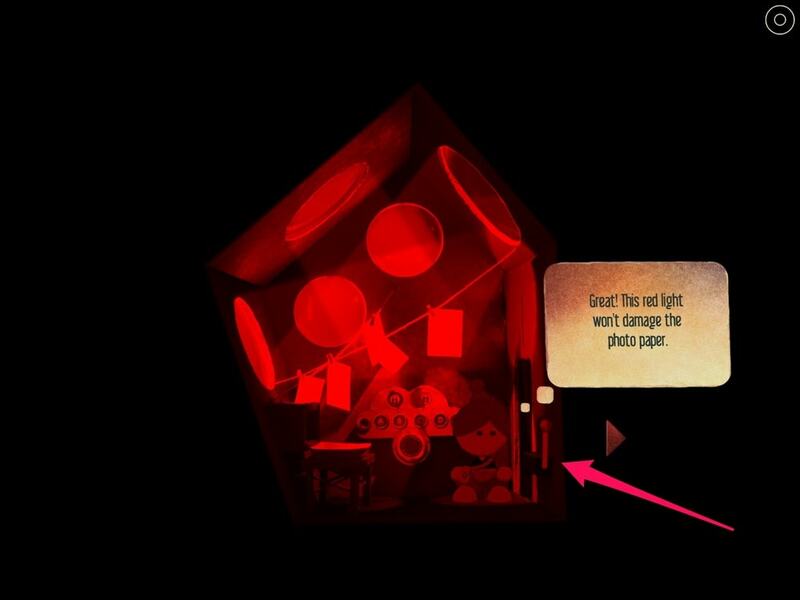 But during certain puzzles it’s in the corner of the screen instead. I’m not sure why they didn’t just put it in the corner all the time. Having to tap on her to access it meant that I sometimes climbed up or down a ladder unintentionally when trying to get to my inventory. 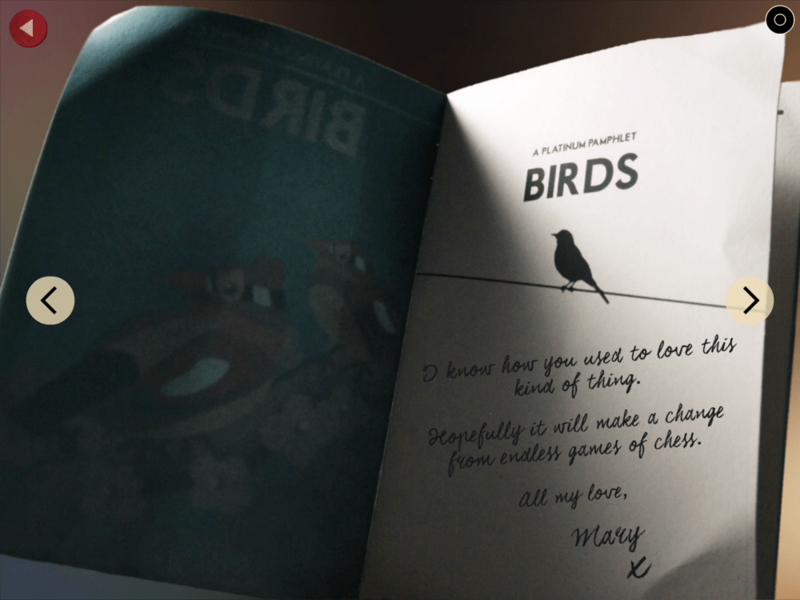 While the immense effort put into the 900-page Handymanual is admirable, I would have preferred they make the puzzles more intuitive and have more clues within the game instead of forcing us to “cheat” by using the manual. I had this same issue with Puzzle House: Mystery Rising, because the clues just appeared in the diary instead of having you find them through exploration. 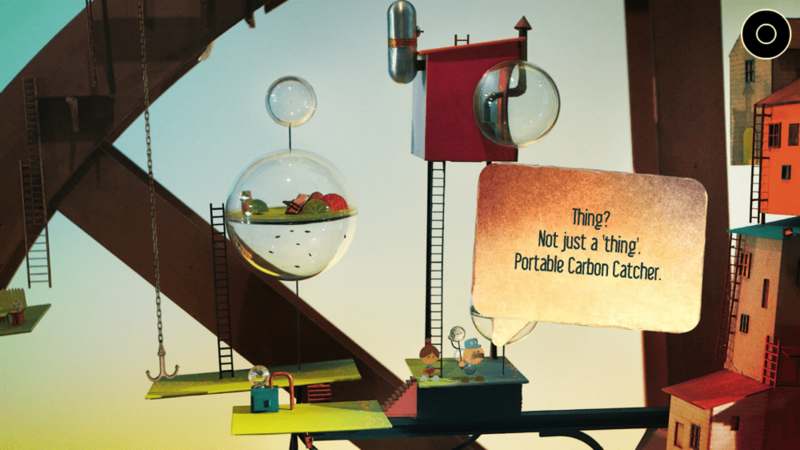 Lumino City doesn’t go quite to that extreme, as you don’t need to use the manual all the time. But it could have been nearly unnecessary if the game just gave better clues. Now that I’ve gotten all that negative stuff out of the way, let me talk more about the good. I really like the game’s tone. There’s a lot of humor, some of it even dark. It has its own unique sense of humor and personality that is portrayed through short bits of dialogue instead of long cutscenes. While playing, I was getting a kick out of the game’s self-awareness and went on a bit of a tweeting frenzy using screenshots of character quotes to take jabs at the game. The story itself is a bit confusing, especially at the end. I’m not exactly sure why her grandpa was abducted. There were also some slides in a projector that I don’t want to spoil for anyone, but I’ll definitely be going back to read them over and see what I can make of them in relation to the rest of the story. 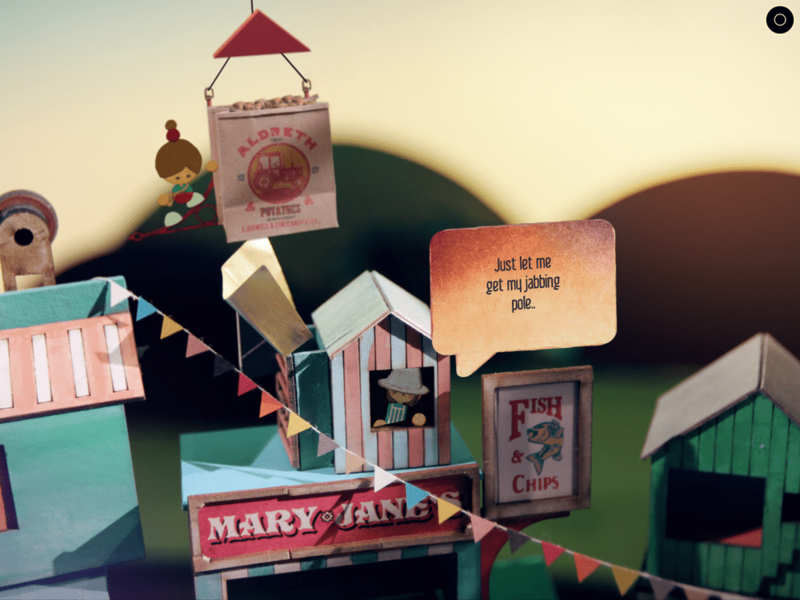 There seems to be something almost sinister going on in this pretty little world of Lumi’s. The pamphlets and books you come across have some odd stuff in them that are worth perusing. It all might be intentionally vague, or I might have overlooked some details. But the characters are quirky and there are so many great quotes to use for screenshots. I almost wish there was an app that would allow you to make your own comic strips using screenshots from the game. I should also point out that some of the puzzles were cleverly done and made me feel smart when I completed them. I also like how you carry a lemon around for most of the game, but I wish more had been done with it. And, of course, the artwork makes it a game worth recommending even if you have to cheat your way through. There is so much attention to detail, and the fact that it’s all made by hand makes it that much more impressive. Something like this doesn’t come around often, so it would be silly to miss out on it. Just be prepared for some frustration. It’s obvious that a ton of love and care went into this game. A bit more attention to the puzzles could have made it a lot more fun and less frustrating, but it’s still worth experiencing. You can download the game here and continue reading below for more in-depth analysis of each chapter. ***SPOILERS BELOW*** If you haven’t played the game yet, come back here after you do! The first few sections didn’t give me any problems. They were pretty straightforward. My problems started with The Photographer, so that’s where my analysis will begin. I actually figured out everything here on my own — turning the lights in the dark room red, mixing the developer fluid — then got completely stuck trying to find a photo to develop. It’s a small level, so there isn’t that much to explore. But I kept running inside and outside to see what I missed. After a break for a week or two and still being stumped, I asked others for help. It turned out I missed the little lever off to the side that makes the printer print a photo that you you need to develop. All that frustration because the lever was too easy to miss. Otherwise, this level was pretty logical and straightforward. But that little lever was the start of a long list of frustrations with this game. Going up and down the ladders while I figured out what to do was time-consuming and annoying. There are several ladders here that lead to different homes. I missed that one of them goes past the homes to the little construction worker and the foot of the crane. I spent a lot of time going up and down the longer ladder on the left, up to the crane. Even though I knew I was supposed to jump on the rope, I couldn’t understand why it wouldn’t work. I was in the crane and could see the rope right below me. Tapping on it did nothing. No feedback whatsoever. I thought it might be a bug. Had the game given some feedback when I tapped on it, such as “I can’t reach it from here,” I might have tried something else. But without that feedback, I didn’t know what was wrong. Then, a bit later on, once I had three people ready to grab onto the rope and power up the crane, it wasn’t enough. But I didn’t realize there was a fourth home because it was just a red dot in the cliff wall. The red dot was a window, and I didn’t know that. This is a situation where a hotspot highlighter would have been useful in identifying interactive items in an abstract world made of simple cutouts and shapes. I’m a huge fan of reflecting puzzles. One of my favorite iOS games is God of Light. I was actually really happy to see one here and excited to find something more my speed. I managed to get through that part and then the keypad stumped me. I saw the four clues on the wall and I knew I had to use them some way. But the problem is that it never would have occurred to me that the order would matter, since they’re just four separate rooms with no indication of order. So when I tried just entering the black dots from all four pictures into the keypad and it didn’t work, I just assumed that was the wrong idea. I didn’t try another order because I had no reason to believe that order mattered here. Instead, I tried subtracting the black dots from the orange ones and all sorts of other convoluted ideas. The game gives no feedback to tell you if you’re on the right track or not, so all I could do is stare at it and hope something hit me. Eventually, I gave up and got help on Twitter from a follower who played the game before. He told me which order the four pictures had to go in and then I got it easily. But how is anyone supposed to get that order unless they miraculously think the same way as the developers or get it by pure luck? This was unduly frustrating due to the water wheel puzzle, but doable. It took a few tries, but at least I had a good idea of what I needed to do, even if it was tricky. The guitar was, thankfully, straightforward and didn’t require playing a tune back by ear. I took screenshots to make it easier, but that might not have even been necessary. I completed this level without help. However, the wrench was very easy to miss and climbing up and down to the man with the guitar was excruciatingly slow. I know the developers worked hard on the artwork and want players to see it, but do we really need to watch Lumi go slowly up and down on that rope each time we change areas? No problems here, really. I thought it was pretty straightforward. I almost missed the blurry object Lumi was supposed to jump onto, but luckily the white spot appeared and I noticed it eventually. I loved the bike going around and through the house. Sweet little chapter. I first missed an arrow that went from the boat to the water tower. It was off to the side and blended in too well with the environment. Luckily, I found it. But then, I later missed the hatch on the boat that lets you go inside. Someone had to tell me about it, even though I’m sure I tapped that general area several times and nothing happened, so I assumed there was nothing there. The potato digging puzzle drove me all sorts of mad, but if you have enough patience, the directions are there. They just don’t give you precise directions, so it still involves some trial and error. I think I was just losing patience with the game on this whole chapter and the potatoes didn’t help matters. I had very little trouble with this level and I loved the visuals. The only puzzle that bothered me was the four buttons, but I eventually got it by tapping them randomly. I found it especially difficult with my fingers covering them and not being quite sure which button I was pressing, since they were so close together. Sadly, this chapter is pretty short for its location in the game. But it’s short and sweet and ends with Lumi flying off on a balloon. Can’t really get much better than that. The Morse code drove me a bit crazy, but at least I knew what had to be done, even if it took a few attempts to get it right. In most puzzle games I’ve played that use Morse code, it’s usually about decoding it more than trying to signal with it. This was by far the most frustrating Morse code puzzle I’ve ever played, because it requires high precision. But it was straightforward, at least, so I knew what I needed to do and could keep at it. That’s very different from having to read the developer’s mind because they didn’t leave enough clues. I also liked that there were a couple of extra words you can spell — CAKE and TEA — if you felt you had a good grasp on the machine. What eventually stumped me was yet another well-hidden arrow. This arrow you see below looked like an extension of the floor to me, so I never tried tapping on it. I was looking for the rope the kid shot up for me, but didn’t realize I could go outside that way. Had it been a brighter red so it stuck out more, I probably would have tapped it much earlier, instead of needing someone to point it out to me. Sure, in hindsight it’s obvious. But I searched around so much for a way to get outside and never noticed that arrow on my own. Had no problems with this except for the pinball machine. 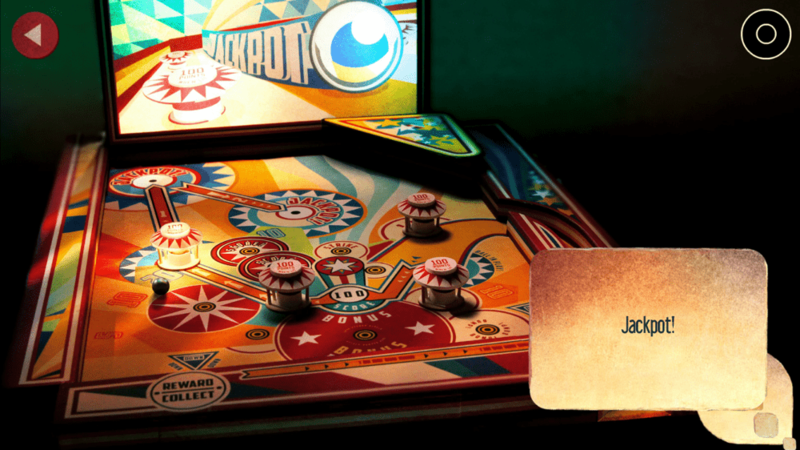 It wasn’t with the pinball machine itself, so much as the “goal” I was given. I was told I need to get two jackpots. I got one, but it told me I need to get the other one first. So I got that one and then it told me I need to get two jackpots. I was driving myself crazy trying to figure out how I would get both jackpots with one ball. Then I went and got the other jackpot separately and completed the level. Why couldn’t that count when I originally got it? Or, at the very least, why couldn’t the game be more clear about what it wanted from me? The messages I got from the game made me believe I needed to get both jackpots with one ball, and that wasn’t the case. Once again, so much time was wasted over silliness that could have easily been avoided. I thought the mail puzzles were logical and they didn’t cause me much trouble. I liked that each one was a very different puzzle. I thought the connect-the-dots one was weak, though, since it connected the dots for you. It might have been cool if you could zoom in and use your finger to draw instead. I also liked the solar panels puzzle. It was somewhat challenging, but not overly so. For the most part, I liked this level. It was unique and worked well with the hand-built aesthetic of the game. I only had one main issue with it. At the very end, when I had the key, I couldn’t find anything to use it on. Then I realized that blue wall has a door on it. Again, a tiny little detail wasted so much of my time. This level was surprisingly easy. It requires tapping on a white dot when it appears for a couple of seconds, but I never had any trouble with it. The mini game of matching cables also felt mostly logical and I didn’t have any problems with it. The punchcard was too small on an iPhone. I kept punching the wrong spots on my punch card and eventually got frustrated enough to switch to my iPad for it. The punchcard is still a nice puzzle. The binary adds enough challenge to keep it interesting. At least on my iPad, I found it doable. The problem is, the password itself could have been anything in the room. I originally thought it had to be eight letters to fill the whole punchcard, so I tried PASSWORD first. Then, PLATINUM. If it can be fewer letters, that opens it up to so many options, including his name, Joshua. 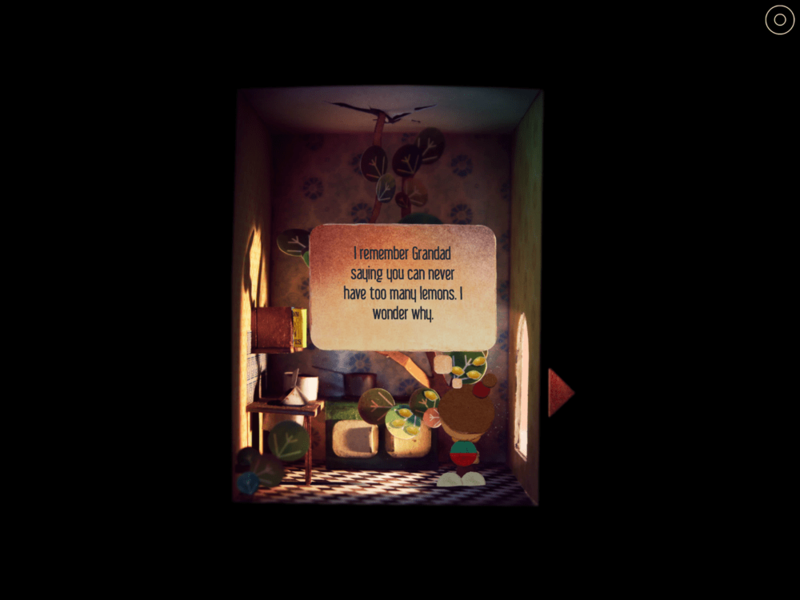 When the puzzle is already challenging in itself, you don’t need to drive the player crazy by making them try every word they can find. Maybe there could be a couple of options to try, but an entire book full of birds? Nothing to let you know if the password has to use all eight lines on the punchcard or can be a shorter word? It ended up being shorter (Mary) and, to their credit, a word that was personal to Joshua, who worked on that computer. But there are so many other words in that room that it could have been. Trying each of them until something works is just ridiculous and tiresome. But, at least “Mary” was written by hand instead of print so it stood out more. The other puzzles in this chapter didn’t bother me. They were logical and just required some thinking and trial-and-error. I felt dumb not using the lemon right away, but I talk more about that below. I want to talk a bit about the lemon. I think it’s cute that they’re used as batteries in the game. Having one lemon with me for the entire game meant I spent a lot of time trying it on different things. If you played the game already (and I hope you did if you read this far! ), then you know that the lemon is used as a battery in the final level. I had forgotten I even had it by then, and when I finally thought to use it, I was angrier with myself than with the game. While I think it would have been cute to make lemonade with it, the consistency of it being a battery made more sense in the end. The only thing that saddens me about it is that there’s never any feedback when you try the lemon on the wrong things. It seems like such a missed opportunity. Imagine all the fun descriptions and dialogue they could have used for it. It would have made it fun to try the lemon on everything, instead of a lesson in futility. I think of games like Broken Sword or Broken Age that would have made it a running joke. And here they do nothing with it other than some references to lemon jams in some library books. Such wasted potential. And that’s everything! I might add some more if I think it’s necessary. But I think I covered all the important bits. I hope you enjoyed reading! Hi, I was wondering if you can help me with something regarding this app. 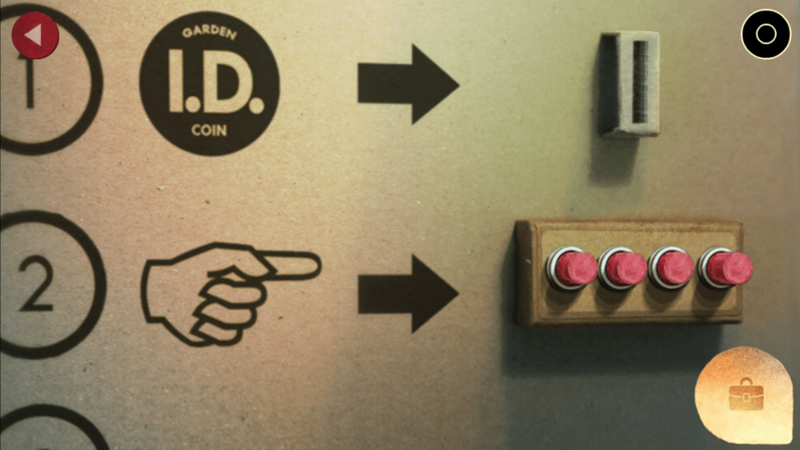 Do you know if there is a way for two people to play this in their own INDEPENDENT games? My two children each have their own iPads with the app installed. But whenever one of them goes to play it, it’s left off where the other one was playing prior to that. Is there any way to set it up so they can play separate games? Thanks for any info to help me! You need I shut of iCloud sync.